The share of federal spending dedicated to our nation’s children has now fallen to just 7.89 percent, which is down from a high of 8.50 percent in 2010. Consequently, the federal share of discretionary spending dedicated to children has dropped by 7.2 percent over the last five years. William Frey of the Urban Institute offers, "Rather than being feared, America’s new diversity – poised to reinvigorate the country at a time when other developed nations are facing advanced aging and population loss – can be celebrated. He hits it on the nail. Our nation's new diversity is not only feared, but there is also nothing to fear and everything to gain from reversing this trend and investing not just in our so-called "future," but also our "present." The federal government makes more than 200 distinct investments in children. These include traditional children’s initiatives like education and child abuse and neglect prevention. They also include other investments that improve the lives of kids, like Medicaid and the Supplemental Nutrition Assistance Program (formerly Food Stamps). 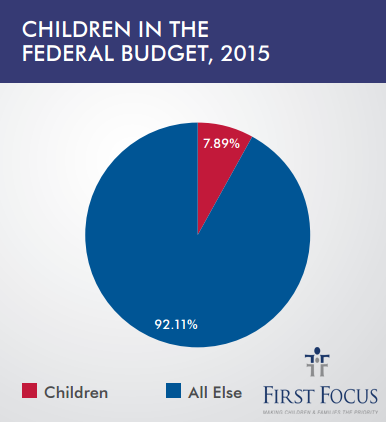 Every year, First Focus publishes a Children’s Budget offering a detailed guide to federal spending on children and an invaluable resource for those seeking to improve the lives of America’s youth. This year’s Children’s Budget 2015 brings more bad and unfortunate news for children. The share of federal spending dedicated to our nation’s children has now fallen to just 7.89 percent, which is down from a high of 8.50 percent in 2010. Consequently, the federal share of discretionary spending dedicated to children has dropped by 7.2 percent over the last five years. In addition, on an inflation-adjusted basis, federal discretionary spending on children has dropped by 11.6 percent between 2010 and 2015. 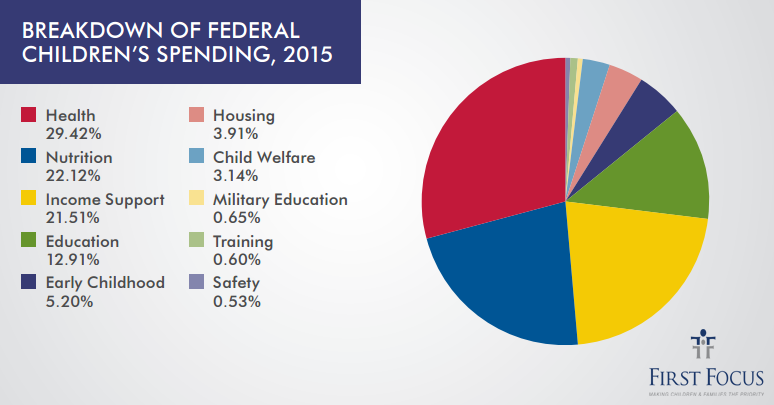 Discretionary funded dedicated to children’s health, education, child welfare, training, safety, and nutrition are all down even without adjusting for inflation. Without adequately funded education, nutrition, housing, early education and care, and other basic supports, the foundation of children’s well-being is at risk. When children grow up without adequate supports, they are less able to support themselves and to contribute to economic growth as adults. . . . A continuous decline in federal support for children over the next decade bodes poorly for their future or the future of the nation. These assertions paint a bleak picture for our children if we as advocates don’t do something. 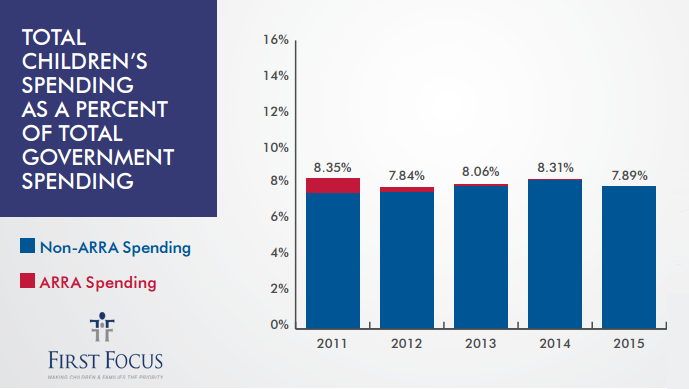 While we saw increased spending as a result of the American Recovery and Reinvestment Act of 2009, the 2011 Budget Control Act introduced sequestration that involved serious cuts to important domestic programs. The fiscal year 2016 discretionary spending levels, because of a lack of relief from sequestration, are the lowest in a decade. Federal investments in our children and our future are going in the wrong direction. What is also evident is that the children of today will not be successful without substantial assistance from an older population that now and in the future is likely to possess superior economic resources. . . . The major question raised . . . is: Will the United States’ adult population (through elections, taxes and other factors) support the youth who are racially and culturally different from themselves and their children or will they perpetuate a dual class education and economic structure which has dominated many areas in the United States, including many areas in the Southwest?
. . . a growing diverse, globally connected minority population will be absolutely necessary to infuse the aging American labor force with vitality and to sustain populations in many parts of the country that are facing population declines. Rather than being feared, America’s new diversity – poised to reinvigorate the country at a time when other developed nations are facing advanced aging and population loss – can be celebrated. In 12 U.S. states (Hawaii, New Mexico, California, Texas, Nevada, Arizona, Florida, Maryland, Georgia, New Jersey, Mississippi, and New York), the U.S. Census Bureau estimates that minority children under the age of 10 are in the majority. And, enrollment in our nation’s public schools has also become majority minority, according to the National Center for Education Statistics. Frey points to states where the difference between the percentage of seniors and children who are white as places where there may be greater tension between the generations and competition for resources allocated to children and the elderly, and where children may be significant losers. According to Frey, among the states, Arizona leads the way with a “cultural generation gap” of 41 percent (83 percent of seniors and 42 percent of children were white). So, how is Arizona doing by its children? The Arizona Daily Sun has documented how budget cuts to child protective services in Arizona caused child welfare caseloads to soar and reports of child abuse to be ignored, how cuts to public education resulted in per-public spending during the recession to decline by 24 percent, and how reductions in state funding to higher education were $300 million below pre-recession levels. In addition, Arizona is the only state in the country to no longer provide health insurance coverage to children under the Children’s Health Insurance Program when it let the program expire at the close of 2013. It now has the second highest uninsured rate for children in the country. Arizona is a state that enacted some of the some most stringent anti-immigration legislation in the country, SB170, and banned schools from offering courses such as Mexican-American studies, which federal courts have partially overturned. The future of areas such as the Southwest, and of the Nation as a whole, may be markedly affected by the extent to which its older populations are willing to step forward to support its increasingly diverse youth. What is clearly evident is that the future of the Southwest and the United States as a whole is increasingly tied to the future of its minority populations. . . . Whether the nation prospers or struggles to maintain its current standard of living and whether it can compete internationally will depend on how well the diverse children such as those in the Southwest do. Ultimately, how well these children do will be how well America will do. If the next generation is going to be handed the bill for our budget deficits, we might as well make the investments needed to help it bear the burden. So far, we seem on track to bequeath our children a double whammy: a mountain of debt and substantial program cuts that will undermine their ability to shoulder it when their time comes. The nation faces the risk of sustained political tension between its racially diverse, Democratic-leaning youth population and its predominantly white, Republican-trending senior population — what I’ve called the Brown and the Gray. Although it’s rarely discussed now, both groups share an interest in equipping the young to obtain middle-class jobs that will generate the tax base to support a decent safety net for the old. Since kids do not vote, we need an informed electorate that will translate its long-standing support for children into votes. This requires that advocates for children, including parents, grandparents, educators, etc., work together to build a grassroots movement to educate the public and demand from policymakers that they put forth a real policy agenda – and not just lip service – that would improve child well-being and then hold those policymakers accountable for real results. Imagine how different things for children might be if politicians were the ones to lose their jobs for failing to improve education, reduce child poverty, etc. What is needed is a focus on the needs of children before it is too late. As the new Congress convenes, I hope the president and members from both parties will keep one number in mind: 8,053,000. That is an estimate of the number of new Americans expected to be born between now and the end of this Congress and President Obama’s second term two years from now. . . . The future of those 8,053,000 little boys and girls deserve to have the two years of this Congress focused on them and not the next election. According to the U.S. Census Bureau, “…50.4 percent of our nation’s population younger than age 1 were minorities as of July 1, 2011.” We need to value each and every one of those children. They are not my children, perhaps. Perhaps they are not your children, either. But, they are our children. We should love them. But even if could choose not to love them, we would still need them to be sound and productive. Because they are the nation’s future. Now is the time for us to work together to educate policymakers at the federal and local level about the harmful path we are on. We must raise our voices in support of those who will put our children and our families first. It is imperative that we, as a country, move down a path that puts children at the forefront of policy decisions. Download you copy of Children’s Budget 2015. President Obama's moving eulogy on Friday for the Rev. Clementa Pinckney, also a South Carolina state senator, is a fitting response to those that say we are taking all of this business about bringing down the Confederate flag too far. Reverend Pinckney, along with eight others, was murdered last week at Emanuel African Methodist Episcopal Church by white supremacist Dylann Roof. This, of course coincided with the Supreme Court decision legalizing gay marriage such that despite the enormous grief that our country has experienced in the wake of these killings to which President Obama gave voice through his impassioned speech and singing of Amazing Grace—has injected great hope and enthusiasm for the future of this country. What a better way to end the week than with the #LoveWins and #GraceWins campaigns. Now there's important work for all sectors of our society to do in order to address the prejudice, discrimination, and structural forms of racism—or "institutionalized oppression" that exists in laws, policies, priorities, and practices legally, as well as extra-legally. 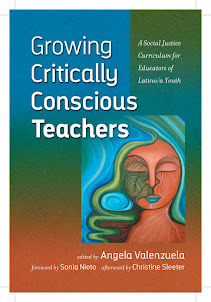 For those of us in education, our task is to further the emancipatory potential of our writing, teaching, and research. of the “wretched of the earth” while maintaining the status quo. What we all have to realize—as Dr. Namakkal indicates—is that naming is claiming, and also that the (re)naming of the world continues into the present and that if looked at closely and critically, reveals extant social relations of power and privilege and how these are inflected by race/ethnicity, social class, gender, and heterosexual normativity. Naming is not only about "who" is doing the naming, but also the world that gets constructed or reinscribed in the process. These reinscriptions stubbornly adhere to old and enduring myths related to racial superiority—otherwise termed, "white supremacy," individualism, and meritocracy—while systematically silent on majority-minority relations and the unearned privileges of the dominant class. Must we rename and go down this so-called, "slippery slope" of interrogating our history to make a possible dent in the symbolic violence associated with the specific names that track back to slavery, conquest, colonization, and imperialism? I agree with Dr. Namakkal that this is indeed our historic opportunity if we are to actually have this "reckoning," the absence of which will have been an opportunity squandered. Yet this is much more than a geographic re-naming of the land and the re-calling of its tawdry, frequently blood-soaked, history. Rather this is our historic opportunity to bring back into existence the heretofore muted voices, stories, and testimonies of the subaltern to restore our nation with a fresh spirit of respect, dignity, and inclusion that brings together the fragments of an imperial and colonial legacy that has systematically negated this conversation as one of its defining features. As Paolo Freire wisely admonished in Pedagogy of the Oppressed, to name or rename requires dialogue and must occur between parties open to listening—most particularly to the historically marginalized Other. This denial of the right to speak on such matters is part of the dehumanizing oppression to which President Obama spoke in Friday's eulogy. Do read this piece in its entirety. Also read and savor the president's exquisite, divinely-inspired eulogy that I also posted to this blog. Sí se puede! Yes we can! And it's going to take a whole heck of a lot of work and really good thinking and a right heart, so we'd best get on with it. lips and at our fingertips in the United States. historians to expose the cracks in the monotonous façade. controversy over re-naming has made it to the “great white North”. that attracts thousands of visitors to its beaches and running trails. signatures by the end of the day on June 23rd. camp during the US-Dakota War of 1862.
of color are still under occupation in the United States today. even worth thinking about, except to control local populations). America and Africa have also moved away from colonial names. now – it’s not a Northern issue, a Southern issue, or a Western issue. opinion, one excellent way to make history. her PhD in History from the University of Minnesota in 2013. "We trade annually about $200 billion, which is twice the amount of [trade between] the U.K. and the U.S. It’s three times what Mexico trades with California, and our prosperity depends on Texas and Texas’ prosperity depends on Mexico. My job is to make sure that awareness of that contribution is widespread. My job is to make sure that people who love Mexico and believe in this relationship contribute their talents and resources to strengthen that relationship." Bienvenido a Tejas y a Austin/ Welcome to Texas and Austin, Consul General Carlos Gonzalez Gutierrez! California has more Mexican immigrants living within its borders than Texas. But in the Lone Star State, the Mexican community is much more diverse. That's just one takeaway from Mexican Consul Carlos González Gutiérrez. 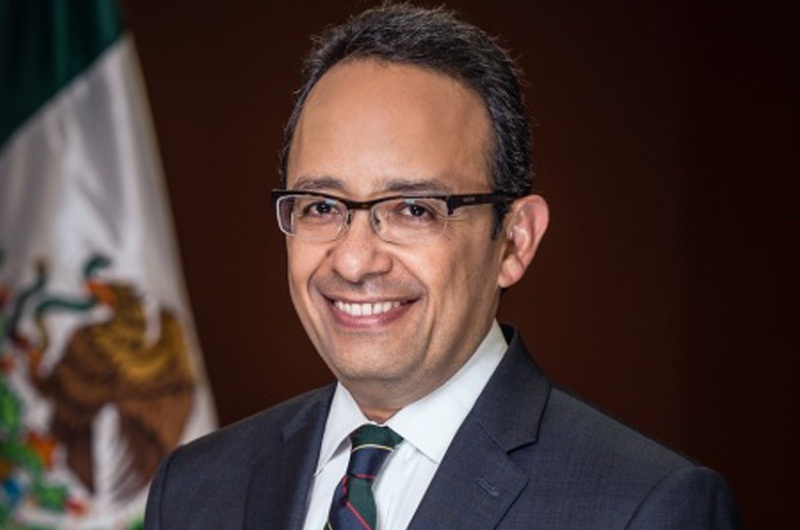 After one month at the helm of Austin's 75-year-old consulate general's office, González, who served most recently as his country's consul in Sacramento, discussed the challenges and benefits of being a Mexican national in the capital city. The Texas Tribune: How was the consulate’s office in Austin selected? Is it based on how many Mexican nationals are in a city? Carlos González Gutiérrez: The consulate of Mexico in Austin has been here since 1940. We have 50 consulates all around the United States; 11 of them are in Texas. The responsibility of this consulate general, like any other consulate, is to promote and protect the rights of our nationals in our jurisdictions, promote its interests, and to promote the image and the prestige of Mexico. Because we are in the capital city, a particular responsibility of ours is to follow up and monitor and inform our government about public policies that are designed at the Capitol and the governor’s office that will have an impact on Mexicans living in Texas. We also ensure that we are able to transmit to elected and appointed officials our positions in a transparent and clear way. TT: Do most people that arrive at the consulate have complaints about the way they are treated? Why do most people come here? CGG: The most basic, and perhaps most important, service we can provide is documentation services. We provide travel documents such as passports or ID documents, like consular IDs. We also provide birth certificates and powers of attorneys so people don’t have to go to Mexico to conduct a commercial operation. I can act as a civil judge abroad, and according to Mexican law I can marry people. Besides that, there is a protection department. Our responsibility is to provide legal protections to Mexicans in dire straits. We help them with advice, make sure they understand their legal situation, and sometimes we are able to provide them legal counsel, or we refer them to trusted sources of legal counsel. We visit prisons, we visit hospitals. Like any other consulate in the world, we have strong immigration advice for people who live here on an irregular migratory status. TT: Do you ever speak to state officials about state immigration policies, like the debate to eliminate in-state tuition for undocumented students? Do you testify or meet with the governor’s staff or other lawmakers on those issues? CGG: Yes, on almost a daily basis. I do not testify. I am a diplomat, a representative of a foreign government. Even if I were invited to a hearing, it would not be appropriate for me to testify in front of another sovereignty. TT: That’s according to Mexican law? CGG: Yes, it’s our policy. TT: So you meet behind closed doors with officials? CGG: What I do is transmit the position of my government on different issues. The U.S.-Mexico relationship, in particular the Texas-Mexico relationship, it’s unique in terms of its intermestic character. “Intermestic” is a concept that tries to define a relationship in which the line that divides the domestic policy and its foreign policy is blurred. There are many areas of policy that are designed and implemented with a domestic policy focus. But nevertheless, they have an impact across the border. So on the one hand, it’s our responsibility at the consulate to let the Mexican government know in Mexico City what the priorities are here. But on the other it’s also in the interest of Texas’ decision makers and, of course, for Mexico to have an active consul in Austin and an active consulate general that is able to transmit with transparency and clarity what are positions are. TT: How are you chosen for this office? CGG: I am a member of the Mexican Foreign Service, and I have been for 28 years. I have reached the rank of ambassador, which is the top rank of a diplomatic career. I have been able to focus exclusively on Mexican communities in the United States. This is my vocation. This is the area I have been able to concentrate on in my professional career. Previously I was the consulate general of Mexico in Sacramento. I was the executive director of the institute for Mexicans abroad in the foreign ministry. I have also had positions in the Mexican Embassy in Washington, D.C., and the consulate general of Mexico in Los Angeles. TT: Do you see that from state to state and city to city, the needs and services you provide are the same? Or do you think the Mexicans living here have different needs or concerns than they do in California? CGG: When you talk about our diaspora, you cannot talk about the one Mexican community. You have to talk about the many Mexican communities in the United States. And that is not truer than in Texas. The diversity, the variety, the complexity of the many Mexican communities that coincide here makes my job very challenging and very fascinating. It goes from the Mexican undocumented worker that had to cross the border surreptitiously to the other extreme of a highly skilled Mexican national that lives in Austin because of the global hunt for talent. And in the middle you can think about many other possibilities and communities. The university also attracts a lot of brilliant Mexican students. It’s completely diverse. TT: How long is your term here in Austin? CGG: I serve at the please of the president. We are nominated by the president and then ratified by the Senate. Usually a traditional diplomatic tour of duty lasts between two and five years. TT: Is that enough time to do what you want to do in Austin? CGG: It better be. I have to start fast, and the foreign ministry is supporting this consulate very heavily. We are going to be moving to a building that is more appropriate for our needs. We are going to increase our infrastructure in terms of officers that are working at the consulate. Texas is Mexico’s most important partner in the United States. We trade annually about $200 billion, which is twice the amount of [trade between] the U.K. and the U.S. It’s three times what Mexico trades with California, and our prosperity depends on Texas and Texas’ prosperity depends on Mexico. My job is to make sure that awareness of that contribution is widespread. My job is to make sure that people who love Mexico and believe in this relationship contribute their talents and resources to strengthen that relationship. TT: When President Obama announced the extension of Deferred Action for Childhood Arrivals (DACA) and the Deferred Action for Parents of Americans and Lawful Permanent Residents (DAPA), this office started offering birth certificates to help people apply for the DAPA initiative. Did you change those policies after the immigration plans were placed on hold by the courts? CGG: No, we are making sure that people understand that the traditional DACA services (announced in 2012) have not been canceled and that almost half of the population that could benefit from it still has not applied. So we have created new programs, such as a partial reimbursement that we are offering to Mexican nationals who come here and ask for help to apply. The fee is $465; we help them with $150 reimbursement once the process is finished. We are also making sure that people do not fall prey to unscrupulous attorneys or non-attorneys who want to take advantage of the confusion. TT: How would you define “irregular”? You mean “undocumented”? CGG: Yes, let’s be more clear. If you are undocumented and living in Texas, you could have been here for two decades as an undocumented immigrant. When you are living your life that way, you have a permanent feeling of vulnerability because you know you can be deported at any moment. So a particular challenge for the consulate is making sure Mexican nationals understand this office is not an authority from which they should keep a distance, but instead an office that is here to help. It’s an office that is staffed by professional, trained people that will help integrate them into U.S. society. TT: Is this building considered Mexican soil, like an embassy? Can someone come here for protection? Is U.S. law enforcement allowed in here? CGG: It has diplomatic and consular immunity. It’s not as if it is Mexican territory. If the unthinkable happened, we’d need to call the police. But there are certain procedures and protocols that according to the Vienna Convention on Consular Relations have to be followed. They cannot enter without an invitation from the head of the mission. TT: Are you a member of the PRI (Institutional Revolutionary Party) in Mexico? CGG: No, I am not a member of any political party. I am a career diplomat and a Foreign Service official. Being a career diplomat allows me to work with whoever is elected president by the people of Mexico. TT: Do you have an opinion in the recent nomination of Secretary Roberta Jacobson for the United States ambassador to Mexico? CGG: Yes, I think that it’s one of the top-ranked diplomats that the United States has. Her nomination has been very well received in Mexico, and it shows clearly the top-priority status Mexico has for the president of the United States. And I am sure she will be welcomed with open arms in Mexico. The data showed no change in ranking among the states with the highest Hispanic populations. California still leads the list (15.0 million), followed by Texas (10.4 million) and Florida (4.8 million). Together, these three states account for more than half (55%) the Hispanic population. But their share is down from 58% in 2000, reflecting a wider dispersion of the nation’s Hispanic population over the past decade and a half. The U.S. Hispanic population has been a key driver of the country’s population growth since at least 2000. But the group’s growth has slowed in recent years, and that trend continued in 2014, as evidenced by new figures released early today by the U.S. Census Bureau. The Hispanic population reached a new high of 55.4 million in 2014 (or 17.4% of the total U.S. population), an increase of 1.2 million (2.1%) from the year before. However, that 2.1% rate continues a trend of slower growth that began in 2010. Hispanic population growth had peaked earlier, in the 1990s. From 1995 to 2000, annual average growth was 4.8%, and growth has declined since then. From 2010 to 2014, the annual average growth had dropped to 2.2%. Part of the reason for this decline in population growth is the slowdown in immigration from Latin America, and in particular, from Mexico. The Census Bureau’s annual population estimates detail the nation’s demographics in a variety of categories, including race and ethnicity, geography, and age. For example, the county with the highest Hispanic population by far is Los Angeles County in California (4.9 million), followed by Harris County in Texas (1.9 million) and Miami-Dade County in Florida (1.8 million). Hispanic populations are not necessarily growing everywhere. From 2010 to 2014, the Hispanic population declined in 11 counties that have Hispanic populations of 10,000 or more, located in Alabama (Jefferson), Arizona (Santa Cruz), Florida (Hardee), Georgia (Clayton and DeKalb), New Mexico (Rio Arriba, San Juan, and San Miguel) and Texas (Duval, Hale and Willacy). The biggest decline came in DeKalb County in suburban Atlanta, where the Hispanic population was 64,279 in 2014, down 4% from 2010. In addition, the new Census Bureau estimates show that Hispanics, with a median age of 29 years, are younger than most other racial or ethnic groups. By comparison, the median age for non-Hispanic blacks is 34; it’s 43 for non-Hispanic whites and 36 for Asians. But Hispanics are growing older: In 2010, the group’s median age was 27, up from 26 in 2000. Today several important civil rights organizations released a statement that is critical of the decision by many parents and students to opt out of high stakes standardized tests. Though we understand the concerns expressed in this statement, we believe high stakes tests are doing more harm than good to the interests of students of color, and for that reason, we respectfully disagree. The United States is currently experiencing the largest uprising against high-stakes standardized testing in the nation’s history. Never before have more parents, students, and educators participated in acts of defiance against these tests than they are today. In New York State some 200,000 families have decided to opt their children out of the state test. The largest walkout against standardized tests in U.S. history occurred in Colorado earlier this school year when thousands refused to take the end of course exams. In cities from Seattle, to Chicago, to Toledo, to New York City, teachers have organized boycotts of the exam and have refused to administer particularly flawed and punitive exams. On Feb. 17th the Newark Student Union, an organization led primarily by students of color, occupied the Newark school district headquarters in part because of their opposition to the implementation of the new Common Core tests. Data obtained through some standardized tests are particularly important to the civil rights community because they are the only available, consistent, and objective source of data about disparities in educational outcomes even while vigilance is always required to ensure tests are not misused. We agree that it is vital to understand the disparities that exist in education and to detail the opportunity gap that exists between students of color and white students, between lower income students and students from more affluent families. There is a long and troubling history of schools serving children of color not receiving equitable access to resources and not providing these students with culturally competent empowering curriculum. Moreover, the schools are more segregated today than they were in the 1960s—a fact that must be particularly troubling to the NAACP that fought and won the Brown vs Board of Education desegregation decision. For these reasons, we understand why national civil rights organizations are committed to exposing the neglect of students of color. Yet we know that high-stakes standardized tests, rather than reducing the opportunity gap, have been used to rank, sort, label, and punish students of color. This fact has been amply demonstrated through the experience of the past thirteen years of NCLB’s mandate of national testing in grades 3-8 and once in high school. The outcomes of the NCLB policy shows that test score achievement gaps between African American and white students have only increased, not decreased. If the point of the testing is to highlight inequality and fix it, so far it has only increased inequality. Further, the focus on test score data has allowed policy makers to rationalize the demonization of schools and educators, while simultaneously avoiding the more critically necessary structural changes that need to be made in our education system and the broader society. We also know that standardized testing is not the only, or the most important, method to know that students of color are being underserved; student graduation rates, college attendants rates, studies showing that wealthier and predominantly white schools receiving a disproportionate amount of funding are all important measures of the opportunity gap that don’t require the use of high-stakes standardized tests. That’s why we’re troubled by the rhetoric that some opponents of testing have appropriated from our movement. The anti-testing effort has called assessments anti-Black and compared them to the discriminatory tests used to suppress African-American voters during Jim Crow segregation. They’ve raised the specter of White supremacists who employed biased tests to ‘prove’ that people of color were inferior to Whites. There are some legitimate concerns about testing in schools that must be addressed. But instead of stimulating worthy discussions about over-testing, cultural bias in tests, and the misuse of test data, these activists would rather claim a false mantle of civil rights activism. To begin, we agree with these civil rights organizations when they write that over-testing, cultural bias in tests, and misuse of test data are “legitimate concerns about testing in schools that must be addressed”—and in fact we hope to hear more from these civil rights organizations about these very real and destructive aspects of high-stakes standardized testing. Moreover, we believe that when these civil rights organizations fully confront just how pervasive over-testing, cultural bias and misuse of data is in the public education system, these facts alone will be enough to convince them join the mass civil rights opt out uprising that is happening around the nation. Let us take each one of these points in turn. The American Federation of Teachers (AFT, the second largest teacher’s union in the nation) conducted a 2013 study based on a analysis of two mid-size urban school districts that found the time students spent taking tests claimed up to 50 hours per year. In addition, the study found that students spent from between 60 to more than 110 hours per year directly engaged in test preparation activities. The immense amount of time devoted to testing has resulted in students in a constant state of preparation for the next high-stakes exam rather than learning the many skills that aren’t measured by standardized tests such as critical thinking, collaboration, civic courage, creativity, empathy, and leadership. The new Common Core tests are only in math and language arts and thus have served to skew the curriculum away from the arts, physical education, civics, social studies, science, music, and a myriad of other subjects that students of color are too often denied access to. Standardized tests have repeatedly been found to contain cultural biases. The process by which test questions are “normed” tends to eliminate questions that non-white students answer correctly in higher numbers. In New York, the number of Black students rated “below standard” jumped from 15.5% to 50% with the introduction of new Common Core tests. English learners did even worse – 84% tested “below standard” on the new tests. This sort of failure has devastating effects on students, and does not reflect their true abilities. Common Core tests are associated with the collection of unprecedented levels of data from individual students, with few safeguards for student privacy. These systems allow for-profit testing companies, and third party companies, access to information that could be used against the interests of students in the future. Bond was expressing then what is today known as the “Zip Code Effect,”—the fact that what standardized tests really measure is a student’s proximity to wealth and the dominant culture, resulting in wealthier, and predominately whiter, districts scoring better on tests. Their scores do not reflect the intelligence of wealthier, mostly white students when compared to those of lower-income students and students of color, but do reflect the advantages that wealthier children have—books in the home, parents with more time to read with them, private tutoring, access to test-prep agencies, high-quality health care, and access to good food, to name a few. This is why attaching high-stakes to these exams only serves to exacerbate racial and class inequality. This point was recently driven home by Boston University economics professors Olesya Baker and Kevin Lang’s 2013 study, “The School to Prison Pipeline Exposed.” In this peer-reviewed study they reveal that the increases in the use of high-stakes standardized high school exit exams are linked to higher incarceration rates. This landmark study should be a clarion call to everyone interested in ending mass incarceration to end the practice of high-stakes exit exams in high school and work towards authentic assessments. The practice of tracking students by perceived ability is a major civil rights obstacle…Ideally, we must provide opportunities for all students to prepare for college and careers without creating systems that lead to racially and regionally identifiable tracks, which offer unequal access to high-quality. We agree with this statement and thank these civil rights organizations for raising concerns about the terrible effects of tracking on the public schools and the detriment that tracking has been to Black students, other students of color, and low-income students. We only want to emphasize that the standardized exams they are now defending are one of the most significant contributing factors to the tracking and racial segregation of students into separate and unequal programs and schools. Because public schools are critical community institutions especially in urban and rural areas, they should be closed only as a measure of last resort. And where a school district deems school closure necessary solely for budgetary or population reasons, the burdens cannot be allowed to fall disproportionately on our most vulnerable communities. Again, we agree, but we want to point out that it is the use of test scores in labeling schools as “failing” that have contributed to clear cutting of schools that serve students of color in cities around the nation—most notably the closing of 50 schools in Chicago last year all in Black and Brown neighborhoods. We call on the civil rights community to support the work of educators around the nation who are working to develop authentic forms of assessment that can be used to help support students to develop critical thinking. Innovative programs like the New York Performance Standards Consortium have a waiver from state standardized tests and instead use performance based assessments that have produced dramatically better outcomes for all students, even though they have more special needs students than the general population—and have demonstrated higher graduation rates, better college attendance rates, and smaller racial divides in achievement than the rest of New York’s public schools. It is the position of the Seattle King County Branch of the NAACP to come out against the Smarter Balanced Assessment tests, commonly referred to as SBAC. Seattle and Washington State public schools are not supplied with proper resources and a lack of equity within our schools continue to exist. The State of Washington cannot hold teachers responsible for the outcome of students test results; when these very students are attending schools in a State that ranks 47th out of 50 States in the Nation when it comes to funding education. Furthermore, Washington State cannot expect the majority of students to perform well on increased targeted performance assessments while the State continues to underfund education in direct violation of a Washington State Supreme Court Order. We also know that our students of color are disproportionately underfunded and will disproportionately be labeled failing by the new SBAC test. For this reason, we view the opt out movement as a vital component of the Black Lives Matter movement and other struggles for social justice. Using standardized tests to label Black people and immigrants as lesser—while systematically underfunding their schools—has a long and ugly history. It is true we need accountability measures, but that should start with politicians being accountable to fully funding education and ending the opportunity gap. The costs tied to the test this year will run into the hundreds of millions of dollars. If the State really wants students to achieve academic performance at higher levels these dollars should be put in our classrooms and used for our children’s academic achievement, instead of putting dollars in the pockets of test developers. We urge families to opt out of the SBAC test and to contact their local and state officials to advise them to abide by the State Supreme Court McCleary decision to fully fund education. We join the Seattle NAACP in calling for true accountability for educational opportunities. For too long, our nation has labored under the illusion that “shining a light” on inequities is an adequate remedy. Inequitable opportunities are manifestly evident to anyone who cares to look. The use of tests for this purpose has become part of the problem, rather than a solution. We reiterate our support for parents and students who make the difficult choice to opt out of high stakes tests, and call on our nation’s leaders to shift policies away from these tests. Glad to see this positive report on dual language schools in Austin, Texas. Dr. Pauline Dow, Chief Academic Officer of Instruction, has brilliantly led this overall dual language initiative for several years. Drs. Deb Palmer​ and Leo Gomez are quoted herein. For us in Texas and many other places throughout the Southwest, English only should become a relic of the past, particularly when bilingual education is imminently do-able throughout so many places in Texas and because bilingually educated children outperform their monolingual peers. Our Academia Cuauhtli / Cuauhtli Academy​ is a further testament to our district's focus. four-year-olds at this Austin infant school have one more class to go. “Hola, buenas tardes,” their teacher says, counting “uno, dos, tres” as they filter into the room. In the background, a singer wails “baila conmigo” – Spanish for “dance with me”. in Texas’ unofficial but increasingly important second language. can keep up with their bilingual peers. time to start is “as early as you can”. “Many parents wonder why the schools are not teaching [the children] Spanish when we are so close to Mexico,” she adds. will have more opportunities if they can speak it. Austin, which has a dual-language programme for children from the age of 3. When she arrived in 2009, the school had just 45 students. years”, Dr Palmer says. But today they have a wider goal: bilingualism. more than 600 schools across the US. provide those children with some form of bilingual education. students in her school are performing better than their peers. routes in both languages; they can interpret better,” she says. Around her, children shout to their friends in English, Spanish or “Spanglish” – a mixture of the two. Realising this, many parents in Texas are choosing to put children who can barely count into their first Spanish lessons. they are learning Spanish – I don’t know it very well but I wish I did.